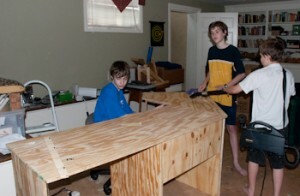 Richard and the boys built a new desk over the weekend. 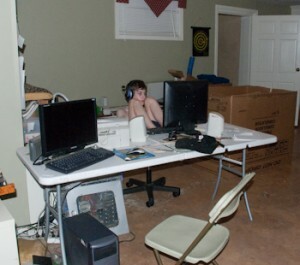 D, our youngest son, saved enough money to buy the components for a computer; he’ll be building it with his Dad. 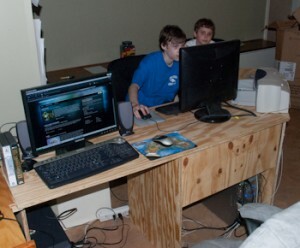 We decided we couldn’t fit his computer onto the table with his older brother’s computer and the one the two younger ones had been sharing. Richard decided to build one that would hold all three. You can see the set up before, during the final clean-up, and after. The new computer will be here any day now — in parts of course. Sorry I didn’t get this in time to check the desk last night. Happy computer assembling, Douglas.